← Indy’s Fashion’s Night Out!! Ag Facts Are Lost In Google! Help Bring Them Back! I haven’t written an Ag blog in a while but two separate things have come out in the news recently that I just can’t avoid addressing. I see several things every day about agriculture, especially things on social media. And honestly- about 85% of it is incorrect. I’ve figured out why it happens and two specific examples come to mind. An article came out saying that Dunkin Donuts has decided to start using cage free eggs and gestation crate free pork. Ok, that’s their decision. But the part that frustrates me as an advocate for the agricultural industry is that consumers are so misinformed and the people who publish these stories go to sources that aren’t fact based. For instance – the source for the Dunkin donuts article was none other than the director of corporate policy of HSUS (If you aren’t familiar with them, HSUS stands for The Humane Society of the United States – an extremist animal rights organization… Not to be confused with your local humane society.) They have an agenda and hire employees to push those agendas and publicize it everywhere. The Associated Press wrote this article and I’m pretty disappointed in them as a fellow journalist for having such a slanted story. They didn’t even try to talk to any university ag scientists or farmers about the topic, they just put the “tug at the heartstrings” opinion in the spotlight. This is where the agriculture industry (me included – that’s why I’m writing this post) needs to work harder to get the scientific information out to the public so that when someone (HSUS) explains gestation cratesas breeding crates where the pigs can’t move for four years (not true), the public will be educated with the facts and knowledge to know the difference. NOTE: Gestation crates are individual housing for sows during the time of pregnancy which are used so that individual sows can be fed relative to their individual needs and to reduce the impact of aggressive behaviors seen in group housing. One important fact that is left out is that the pigs are moved to farrowing crates once they give birth to better care for their litter and reduce the risk of the moms accidentally stepping on the piglets. They don’t stay in gestation crates their entire lives. 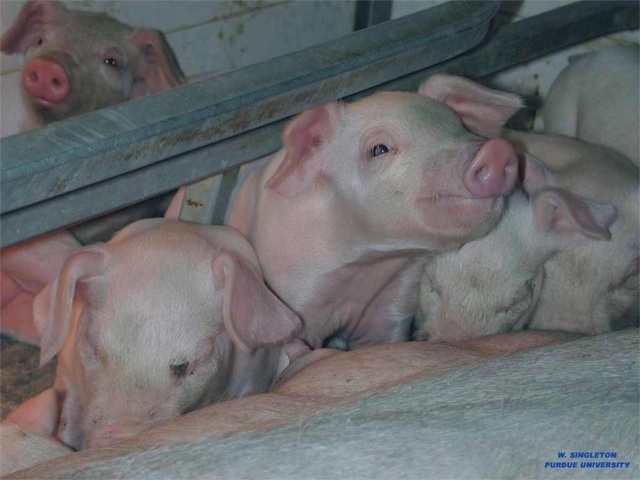 Piglets in farrowing crates have more room and are protected from various elements. Second example: Another article was published about a man who was eaten by his hogs. Right away people are freaked out, but there are questions we need to ask: what breed of hog were they? Were they castrated or boars? Did the man fall and start bleeding? People don’t think to ask these questions but they’re important. These are some of the reasons we castrate pigs and dock their tails. They live in social groups which creates dominance (just like in our society) so the more dominant they are, the more aggressive they become. The reason we dock their tails is because if they get in a fight, the aggressive pig will bite the other pig’s tail off and cause injury. The news makes this out to be that all pigs are dangerous and that “no one is safe around them” kind of story. Again, not true. The questions above need to be answered and there have to be other explanations than his pigs just “attacked” him. They don’t do that for fun. But the main point of my blog today is to highlight the fact that the information put out by these groups is so easy to find that no wonder people believe the extremists. Just the other day, I Googled “average life expectancy of a sow” and not one of the top ten results was from a trusted (educational) source! No universities, no farmers, no vets. Just animal activist groups, pro-vegetarianism websites, people who don’t provide the right information. How can we expect the public to find out the truth if it’s hidden in the Bermuda triangle of Google? One thing I think those types of organizations get right (when it comes to publicizing their information) is their Search Engine Optimization (SEO). This is the process of using good key words and search words when publishing your information. Important parts of this include good, descriptive titles, tags (especially for blogs) and getting it out on social media sites to spread awareness and raise viewing numbers for that information. To learn more about how to improve your SEO, click here. Consumer Challenge: go out at learn something new today about some part of agriculture! Just make sure it’s from a reliable source like universities, or farmers! Agvocate Bloggers – keep posting your factual, educational information and work on your blog’s SEO to help bring it to the front of the search page. Universities and Veterinarians- when you publish educational agricultural information put it on Google and make it easily accessible to the public! You can’t admit that the first place you go to look something up isn’t google? Help others learn the things we’ve been trying to tell them! Also, share it on social media! This is the fastest way to get your information to the public! Have any of you taken steps to increase your SEO? I’d love for you to share them! Posted on October 3, 2012, in Agvocating and tagged agriculture, agvocate, animal rights organization, Associated Press, Dunkin Donuts, farrowing crates, Google, Hog farmer eaten, HSUS, pigs, science, SEO, sows. Gestation crates. Bookmark the permalink. 1 Comment. That was a very “Fair and Balanced” blog Chelsea….and so informative on improving your SEO ie “Google” listing heirarchy!